Joanne White posted Sunday April 1, 2018. Last night Ausdeck Patios and Roofing Archerfield Speedway played host to night two of the 2018 Easter Triple Challenge, which also doubled as a round of the East Coast Logistics Series, with Lachlan McHugh getting the win for second time in as many days. The Gold Coast based teenager started the forty-lap main event from position three, dropped back to fourth early in the race, only to fight his way forward, making his way past Andrew Scheuerle, only to then surrender the position to Peter Lack. Lack was in truly magnificent form in the Mega Fuels Q5 racer, having an intense battle with Mitchell Gee as they fought over second, Lack absolutely relentless as he tried to find a way underneath the Q36 racer, all the while McHugh sat back and waited for the right opportunity to make his move. Lack was persistent, running the bottom and racing side-by-side with Gee for several laps before contact between the pair turned Lack around in turn four. Lack was able to keep the car going, though surrendered positions to McHugh, Andrew Scheuerle, Luke Oldfield and Jayden Peacock. McHugh started his own challenge against Gee, the duo going wheel-to-wheel until McHugh finally managed to slip through on the bottom. Gee of course fought back, sliding back past McHugh on the bottom of turn three, only for McHugh to be too quick on the top side coming out of turn four. McHugh set out after race leader Robbie Farr, eventually closing in when they hit lapped traffic, before sliding straight underneath the Q7 racer as they rounded turn three. Farr regained the lead half a lap later, with McHugh again diving back into the lead on the following lap. Farr briefly regained the lead after a stoppage, diving underneath McHugh in turn one, only for McHugh to return serve and regain control of the race half a lap later. From there McHugh was unstoppable, opening a comfortable margin over Farr and the rest of the field, leaving them to argue over second as he raced toward the chequered flag and took his second win of the weekend. Luke Oldfield started the main event from position nine after some hard-luck in the heats, but managed to displace Farr from second and started closing the gap to McHugh as the laps ticked away. Luke Oldfield finished second with Robbie Farr home in third. Peter Lack had a brilliant run to finish fourth ahead of Mitchell Gee who rounded out the top five. Cody Maroske had a blistering run as well, crossing the line in sixth after starting back in sixteenth. Qualifying got underway with Luke Oldfield setting the pace, stopping the clock an unbeatable 11.645 seconds. Robbie Farr was second quickest with an 11.718 second lap, while Andrew Scheuerle (11.732), Lachlan McHugh (11.738) and Bryan Mann (11.760) rounded out the fastest five. The top eight cars all managed to dip into the 11-second bracket while less than one second separated the fastest twenty-nine cars. 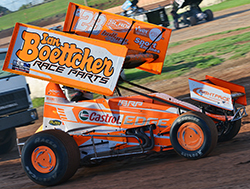 Scott Genrich had mechanical issues in the Q18 racer and did not record a time. Heat one started with Nelson Reddacliff and Mark Pholi from the front row, with Reddacliff initially getting the jump and leading the field to the first corner, only for Pholi to power around the outside to take control of the race as they navigated turn two. Brett Minett and Stewart Craig raced side-by-side, with Minett securing the advantage by the end of the first lap. Craig immediately found himself under immense pressure from both Jackson Delamont and Mitchell Gee, the pair trying to race either side of the Q9 racer as they completed the first lap. Delamont, on the top side, got the job done, with Craig holding on to fourth. Gee surrendered a position to Luke Oldfield, who was having a brilliant run on the top side, leaving Gee with a hard-charging Ben Hilder on his tail. Oldfield set about finding a way past Craig, putting all kinds of pressure on the Ausdeck Patios racer, but things came undone when Delamont, just in front of them, got a little sideways in turn one. Craig had nowhere to go and collected the N48 racer, inverting his own car high on the track, and leaving Oldfield no room to avoid contact. Both Craig and Delamont were unable to restart the event, while Oldfield took the green from the rear of the field. Pholi led the restart from Reddacliff and Minett, but barely a lap into the restart contact between Bryan Zelinski and Randy Morgan ended with Zelinski up-side-down in turn one. Both drivers walked away but neither were able to restart the event. Pholi again led the restart and while Gee was all over the back of Minett, Minett was looking for a way underneath Reddacliff. Oldfield began making his way forward once more, soon catching the tail of Gee, with Gee making his way past Minett when the Q94 racer got a little sideways in turn two. Gee put all kinds of pressure on the back of Reddacliff for the remainder of the race but ran out of laps before he could make a pass. Mark Pholi got the win ahead of Nelson Reddacliff and Mitchell Gee, with Brett Minett home in fourth ahead of Luke Oldfield, Ben Hilder and Shane Matthews. Bryan Zelinski, Randy Morgan, Jackson Delamont and Stewart Craig all failed to finish the event. Darren Jensen started heat two from pole position with Karl Hoffmans alongside. The first start was aborted, officials deeming Jensen to have jumped the start, relegating the Q75 racer to the second row for the restart. Brad Ayers inherited pole position for the restart but it was Hoffmans who secured the lead when the light went green. Ayers settled into second but immediately came under fire from Tony Wynne and Jayden Peacock. Peacock slipped underneath Wynne, but behind them Andrew Wright rode out a huge wreck in the N78 racer, landing on top of a luckless Jason King. Wright walked away from the wreck but his race night over, while King as also unable to restart the event. Hoffmans led the restart from Ayers, Wynne and Peacock, with Peacock wasting no time and raced underneath Wynne as soon as the race resumed. Wynne was left with Darren Jensen and Robbie Farr on his tail, with both rivals eventually getting around the outside of the NQ8 racer. While Farr found a way past Jensen and started closing in on Peacock, Peacock tried to find a way past Ayers. Ayers refused to surrender his position though and, with Farr closing in fast, it became a thrilling battle for the minor places. Karl Hoffmans got the win ahead of Brad Ayers, Jayden Peacock and Robbie Farr, with Darren Jensen, Adam Butler, Tony Wynne and Dylan Menz rounding out the finishers. Andrew Wright and Jason King did not finish the race. Kristy Bonsey led the heat three field to the green, with Mitch Gowland sharing the front row for the start. Bonsey go the jump but Gowland powered around the top side to secure the lead by the time they hit turn two, leaving Bonsey in second ahead of Brendan Scorgie. Dave Whell got the better of Brent Kratzmann on the start, quickly racing in front of the Q2 racer before ducking underneath Steve Greer and setting his sights on Scorgie. Kratzmann followed Whell under Greer while behind them Peter Lack and Andrew Scheuerle fought over the minor positions, going wheel-to-wheel as they made their way past Greer and set out after Kratzmann. Scheuerle displaced Lack, just moments before Lack got a little sideways in turn one and allowed both Kratzmann and Scheuerle to pull ahead, with Scheuerle soon making his way underneath Kratzmann as they rounded turn four. Scheuerle had the Ausdeck Patios Q25 racer set up beautifully and, taking the high line, made it all look too easy as he raced seemingly effortlessly around Whell to move into fourth as they raced through the final corner of the race. Mitch Gowland got the win ahead of Kristy Bonsey and Brendan Scorgie, with Andrew Scheuerle across the line in fourth ahead of Dave Whell, Brent Kratzmann, Peter Lack, Steve Greer, Liam Atkinson and Andrew Marks. Heat four started with Phill Foster and Mick Sauer from the front row, with Sauer getting the jump when the lights went green and quickly settling into the race lead and Anthony Lambert quickly racing around the top side of Foster to secure second. Michael Saller and Lachlan McHugh both made their way past Foster on the opening lap, with McHugh then slipping underneath Saller as they began the second lap of the race. Bryan Mann searched high and low for a way past Foster, with Andrew Corbet on his tail the whole time, while deeper in the field Cody Maroske, Dale Shilleto and Kris Jennings argued over the minor places. Jennings and Maroske led the battle at the back and soon caught the tail of Mann and Corbet, with Maroske on the bottom and Jennings running mid track, the pair raced up the inside of Corbet, the trio three wide through turn four but with Corbet coming out in front of Maroske and Jennings. Half a lap later Maroske raced underneath Corbet and set his sights on Mann, while behind them Dale Shilleto raced boldly underneath Kris Jennings and Andrew Corbet in just one corner. McHugh quickly made his way past Lambert to take over second, and set about trying to close the massive gap to race leader Sauer. Mick Sauer went on to take the win ahead of Lachlan McHugh and Anthony Lambert, with Michael Saller home in fourth and leading Bryan Mann, Cody Maroske, Dale Shilleto, Phill Foster, Andrew Corbet and Kris Jennings across the line. Adam Butler started heat five from pole position with Cody Maroske alongside and Brett Minett and Anthony Lambert sharing the second row. Butler and Maroske drag raced into turn one side-by-side, and remained that way for most of the first lap before Maroske managed to secure the lead. Butler settled into second ahead of Lambert while Dylan Menz got the better of Minett, and Lachlan McHugh and Jayden Peacock searched the high line for a way past Ben Hilder, as Hilder tried to get underneath Minett. Menz faded a little, dropping back several positions, while McHugh and Minett argued over minor places, the pair coming together before spinning onto the infield, with Minett stopped far enough off the track that a stoppage was not required. McHugh managed to keep the car moving and rejoined the race at the very back of the field, a quarter of a lap behind his nearest rival. McHugh had incredible speed and set about catching the field and starting to work his way through the back markers while Peacock and Hilder battled over mid-field positions. Cody Maroske got the win, a little over three and half seconds ahead of Adam Butler in second, while Anthony Lambert crossed the line in third and led Ben Hilder, Jayden Peacock, Dylan Menz, Lachlan McHugh, Bryan Zelinski and Andrew Marks across the line. Brett Minett did not finish the race. Phill Foster and Kristy Bonsey led the field to the green for the start of heat six, with Bonsey getting a brilliant start, quickly securing the lead and opening a small margin on Foster and the rest of the field by the end of the first lap. Peter Lack had a breath-taking charge on the low line, racing underneath Dave Whell as they came out of turn two, with Luke Oldfield on his tail. Tony Wynne was looking for a way past Brad Ayers, with Andrew Corbet in hot pursuit, when Lack, still committed to the bottom, raced up the inside of Corbet and had a massive look underneath Wynne. Corbet fought back on the top side and was looking to go around Lack when Jason King spun to a stop behind them and brought the race under caution. Bonsey led the restart from Foster and immediately opened a sizable lead, with Foster left to defend his position from Ayers, while Lack and Corbet searched for a way past Wynne. The battle left Wynne turned around in turn three, after contact with Corbet, and while the rest of the oncoming field tried to avoid the stranded car, Luke Oldfield clipped the left front of Wynne with his own right rear, tipping both cars over. Both drivers walked away and while Wynne attempted to restart, he pulled out of the event before completing another lap. Dave Whell, who had his main wing damaged as Oldfield inverted the Q17 racer, was forced to strap the main wing to the car in order to finish the event. Bonsey again led the restart from Foster and Ayers, with Bonsey remaining untouchable out in front. Lack continued his climb through the field, while Ayers searched relentlessly for a way past Foster. Kristy Bonsey took the win ahead of Phill Foster and Brad Ayers, with Peter Lack coming home in fourth ahead of Kris Jennings, Andrew Corbet, Jason King and Dave Whell. Tony Wynne and Luke Oldfield did not finish the event. Heat seven started with Darren Jensen from pole position and Steve Greer alongside. Jensen got a brilliant start and seemingly effortlessly secured the lead while Mick Sauer and Mark Pholi raced up the inside of Greer to move into second and third respectively. Michael Saller raced around the outside of Karl Hoffmans and Mitchell Gee before setting his sights on Greer, while Robbie Farr slipped underneath Hoffmans and Gee as they rounded turn two. Farr began closing in on Saller, who was working the high line and trying to find a way past Greer and Pholi, who were involved in their own battle for the minor places that saw them exchange positions several times. With Greer momentarily back in front, Pholi raced underneath the Q84 racer, before Greer returned serve less than half a lap later, only this time with Saller on his inside, the trio now three-wide through turn four. Saller came out in front and set off after Sauer, leaving Greer and Pholi to defend their positions form Farr and Gee. Saller took to the high as he searched for a way past Sauer, but switched briefly to the low line in an effort to get the job done. Saller and Sauer raced wheel-to-wheel for a few laps, trading places a couple of times, before Saller secured the advantage and left Sauer with Farr on his tail. Darren Jensen easily got the win ahead of Michael Saller and Mick Sauer, with Robbie Farr, Mark Pholi, Mitchell Gee, Steve Greer, Karl Hoffmans, Randy Morgan and Liam Atkinson rounding out the finishers. The eighth and final heat of the night saw Stewart Craig and Nelson Reddacliff share the front row for the start, with Craig getting a superb start and immediately opening a very comfortable margin on the rest of the field and while Reddacliff held second for half a lap, Brendan Scorgie soon made his way underneath the Q85 racer and relegated him back to third. Brent Kratzmann and Andrew Scheuerle began to make their way forward, with the pair racing underneath Mitch Gowland in the opening corner. Kratzmann had a massive look on the inside of Bryan Mann in turn two, only for Mann to come back strong on the top side to maintain his position. Jackson Delamont soon made his way past Reddacliff, with Kratzmann, Mann and Scheuerle following soon after. Kratzmann set out after Delamont, with Mann and Scheuerle in hot pursuit, and while Mann made his way around the outside of Kratzmann, Kratzmann fought back to regain his position moments later, only to promptly surrender positions to both Mann and Scheuerle. Stewart Craig took the win ahead of Brendan Scorgie and Jackson Delamont, with Bryan Mann leading Andrew Scheuerle, Brent Kratzmann, Nelson Reddacliff, Dale Shilleto, Mitch Gowland, Scott Genrich and Shane Matthews home. Nine cars hit the track for the ten-lap C-Main with Kris Jennings and Andrew Marks from the front row. Jennings secured the lead when the green flag flew, with Marks settling into second in advance of Dale Shilleto. With barely a lap on the board the race was brought to a stop when Scott Genrich upended the Q18 racer in turn one. Genrich walked away but was unable to restart the race. Jennings led the restart from Marks and Shilleto, with Shilleto putting enormous pressure on Marks for several laps before racing around the Q96 racer a few laps into the race. Randy Morgan caught the back of Marks as the race drew to a close, but ran out of laps before he had a chance to make his move. Dale Shilleto got the better of Kris Jennings as the laps wore away, with Shilleto getting the win and Jennings home in second, the pair securing transfers to the back of the B-Main. With one B-Main contender already withdrawing from the event, Andrew Marks, who finished third in the C-Main, would also be granted a start in the B-Main. Randy Morgan was fourth across the line ahead of Bryan Zelinski, Jason King and Shane Matthews, while Liam Atkinson and Scott Genrich failed to complete the ten-lap journey. Peter Lack easily won the Bronze Shootout, stopping the clock at 12.692 seconds and securing a transfer to the Silver Shootout event. Mitchell Gee also managed to snare a start in the Silver Shootout after going second quickest in the Bronze Shootout, his time of 12.914 seconds beating the 13.179 second lap of Michael Saller. Saller and Jayden Peacock, who didnâ€™t turn a lap during the Bronze Shootout, were eliminated as Lack and Gee advanced. Peter Lack and Mitchell Gee were joined on track by Lachlan McHugh and Bryan Mann for the Silver Shootout, with Mitchell Gee this time securing the quickest time of the group, stopping the clock at 12.717 seconds. Lachlan McHugh, who stopped the clock at 12.772 second, would advance with Gee to the Gold Shootout, while Lack (12.908) and Mann (12.975) rounded out the Silver Shootout contenders. Robbie Farr and Andrew Scheuerle joined Mitchell Gee and Lachlan McHugh on track for the Gold Shootout, with Robbie Farr the quickest of the quartet, earning pole position with a 12.576 second lap. Mitchell Gee (12.706) was second in the Shootout, ahead of Lachlan McHugh (12.765) and Andrew Scheuerle (13.080). Eighteen cars lined up for the fifteen-lap B-Main, with Kristy Bonsey and Brent Kratzmann to lead them away. Bonsey got a great start and led them into turn one, but Kratzmann was too quick on the top side and quickly secured the lead coming out of turn two. Mick Sauer settled into third behind Bonsey but with Ben Hilder right on his tail, while Brett Minett tried to make his way through the middle of the field, and Andrew Marks fought his way past Tony Wynne and Steve Greer at the back of the field. Dale Shilleto and Karl Hoffmans brought the race under caution just a few laps into the event when they spun to a stop in turn four. Kratzmann led the restart from Bonsey and Sauer but only half a lap into the restart and the race back under caution for Minett who had collided heavily with the wall coming out of turn two. Kratzmann, Bonsey and Sauer again led the restart, the trio virtually untouchable out in front, while Darren Jensen and Mark Pholi chased after Ben Hilder and the final transfer position. Another stoppage, this time for the upturned Karl Hoffmans in turn one, saw another restart, with the running order remaining unchanged, while mid-field Nelson Reddacliff and Stewart Craig traded places back and forth for a couple of laps until Reddacliff spun the Q85 racer in turn two and brought the race under caution once more. Kratzmann led the restart from Sauer, who had moved into second after a thrilling battle with Bonsey, with Bonsey behind him in third. Darren Jensen raced up the inside of Ben Hilder, while behind them Mark Pholi and Andrew Corbet raced side-by-side. Steve Greer had a spin in turn four before nosing the car into the wall and bringing the race back under caution. Brent Kratzmann again led the restart and went on to take the win ahead of Mick Sauer and Kristy Bonsey, while Ben Hilder secured the final transfer to the A-Main when he crossed the line fourth. Darren Jensen finished fifth, after a truly breath-taking race-long battle with Hilder, and would act as first reserve for the main race, only getting a start if anyone doesnâ€™t make it through the first lap. Mark Pholi finished sixth ahead of Andrew Corbet, Mitch Gowland, Adam Butler, Stewart Craig, Dale Shilleto, Tony Wynne, Kris Jennings, Nelson Reddacliff and Andrew Marks. Steve Greer, Karl Hoffmans and Brett Minett did not finish the event. Robbie Farr and Mitchell Gee led the field to the green for the start of the forty-lap A-Main event, with Gee securing the lead and Lachlan McHugh attempting to race up the inside of Farr to lock into second. Behind them though chaos was unfolding, when Ben Hilder came down track slightly coming out turn two, to avoid another car that was bouncing off the back straight wall. Contact with Brent Kratzmann launched Kratzmann into the air, the Q2 racer rolling down the back straight, while Kristy Bonsey did a remarkable job to avoid the airborne car in front of her. Kratzmann walked away from the wreck, but was unable to restart the event, giving Darren Jensen the chance to take the green next time around. A full restart followed with Robbie Farr this time securing the lead and Lachlan McHugh racing up the inside of Mitchell Gee as they fought over second. Mid-field though Michael Saller spun the N56 racer in turn two and brought the race under caution with only half a lap completed. This time around it was Robbie Farr who again secured the lead with Mitchell Gee this time settling into second ahead of Lachlan McHugh, but McHugh now had Andrew Scheuerle and Peter Lack right on his tail. Scheuerle and Lack were fierce, running side-by-side and they both searched for a way underneath McHugh, while behind them Luke Oldfield, Bryan Mann and Jayden Peacock negotiated over the mid-field places. Lack committed to the low line, having moved a fraction ahead of Scheuerle, and before long made his way boldly underneath McHugh before turning his attention to Gee. McHugh of course fought back but Gee and Lack were completely embroiled in their own battle for second, running two abreast with Lack relentlessly working the bottom and Gee refusing to surrender on the top. Every time Lack looked to have his nose in front, Gee came back harder on the high line, maintaining second and denying Lack at every corner. But Lack was persistent, determined to find a way through, while McHugh sat behind them ready to strike if either made even the smallest of errors. As Lack looked underneath Gee once more, McHugh started to race around the outside of the pair, with Lack collecting the left rear of the Titan Garages car of Gee in turn three before looping his Mega Fuels Q5 racer in turn four and surrendering positions to McHugh, Scheuerle, Oldfield and Peacock before straightening the car and resuming his pursuit of a podium result. McHugh picked up where Lack left off, working the bottom trying to find a way past Gee before having a look around the outside. McHugh eventually found his way through on the bottom of Gee, with Gee immediately coming back on the inside of McHugh. McHugh was too quick on the top side though and managed to hang on to second before setting out after Farr. With twenty-five laps still to run Farr began navigating lapped traffic as McHugh closed in and Andrew Scheuerle edged closer to Mitchell Gee. Lack had made his way past Peacock and was closing in on Oldfield, who was chasing down Scheuerle and Gee, while Bryan Mann and Brendan Scorgie traded places mid-field. Scheuerle stepped up the pressure on Gee while Oldfield searched for a way through while at the front of the field McHugh had caught Farr and the pair were exchanging slide jobs as the fought over the lead. McHugh made his way underneath Farr, only for Farr to fight back on the bottom half a lap later to regain the lead for a lap before McHugh raced back underneath the Q7 racer in lapped traffic on the following lap. The race, which had run thirty-laps without a stoppage, was brought to a stop when Dylan Menz, who had been have a mesmerising run on the high line, tipped the Q46 racer in turn one. Unfortunately for Menz his race was over. Lachlan McHugh led the restart from Robbie Farr and Luke Oldfield with ten laps left to run and while Farr raced underneath McHugh as they rounded turn two, McHugh regained the lead by the time they hit turn three. Farr gave chase and had a brief look underneath the Q23 racer a lap later but was unable to stop McHugh from taking the win. With McHugh starting to open a small lead, Oldfield closed in on Farr and began his challenge for second, while Mitchell Gee and Peter Lack argued fiercely over fourth and fifth. Lachlan McHugh made it back-to-back wins for the weekend so far, with Luke Oldfield getting the best of Robbie Farr in the final few laps of the race to secure second. Robbie Farr crossed the line in third to round out the podium, while Peter Lack and Mitchell Gee completed the top five. Cody Maroske had a massive drive from sixteenth on the starting grid to cross the line an impressive sixth, leading Andrew Scheuerle, Jackson Delamont, Anthony Lambert, Michael Saller, Dave Whell, Ben Hilder, Brendan Scorgie, Kristy Bonsey, Mick Sauer, Darren Jensen and Brad Ayers across the line. Bryan Mann, Dylan Menz, Jayden Peacock and Brent Kratzmann all failed to finish the event. Sprintcars return to Castrol Edge Lismore Speedway tonight for Night three of the 2018 Easter Triple Challenge. Can anyone stop Lachlan McHugh or will the talented teenager make it three from three? The racing this weekend has been nothing sort of exceptional and tonight is set to be no different. Get on out to Castrol Edge Lismore Speedway tonight and cheer on your favourite.